In November last year the brother of Keith Moncrieff, one of two workers who in 2003 tragically died in an accident on the Shell Brent Bravo North Sea oil platform, sent a heart-rending letter to Royal Dutch Shell Plc Chairman Charles Holliday. Shell are in trouble. Deep trouble. Peter Robinson’s dossier on Shell Nigerian corruption? FROM A POSTING ON OUR SHELL BLOG – IS THE AUTHOR THE “STREET FIGHTER” PETER ROBINSON? Shell is dark, corrupt and dirty? I share your sentiments wholeheartedly Bill. The company has been caught with its pants down, with senior staff most likely involved in kickbacks. How could this have got through the numerous assurance including Integrity teams, Auditors etc who all form part of the checks and balances to ensure this is easily picked up (particularly in Nigeria). Either the company is full of incompetence, or there has been a blind eye turned to such corruption. I say (a lot of) both. The amounts of money involved is not loose change. I say this problem is endemic in many of the hardship countries we do business in. Shell is dark, corrupt and dirty and I am beginning to question if I am working for a far more sinister company than I originally thought. And this is playing on my mind. A chilling documentary “Mad Dog: Gaddafi’s Secret World” is currently available to view on BBC Player, but only for another 4 weeks. It is about “the dark world of Colonel Gaddafi, the Libyan dictator who combined oil and the implied threat of terror to turn western powers into cowed appeasers”. Following publication of my article Shell false pledges of transparency and openness contributors to this website have been accused of hating Shell. That is not the case. Many of us do, however, take great exception to the hypocritical claims made by successive RDS Chairman and CEO’s over many years that Shell operates within an ethical code – the General Business Principles – which includes a pledge of transparency. 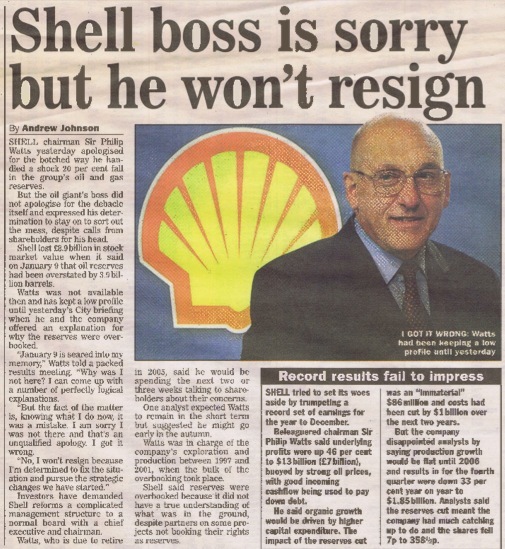 I warned Shell for over a decade that Malcolm Brinded (above) has no scruples. Indeed, in 2009, I published an article under the headline: Royal Dutch Shell Fat Cat Malcolm Brinded: Big Brain but no scruples. Brinded was an executive director of Royal Dutch Shell Plc until 2012 and is still Chairman of the Board of Trustees of the Shell Foundation. Forgot the initial cost estimate, probably around $8-10 billion. Now 10+ years too late and ballooned to $50 billion. Most normal companies would have gone bust long ago. Shell inherited some beauties from the boys of the roaring 90s. I hope someone will write a book one day on this era.